Legislator Sarah Anker joined the Mount Sinai High School Drama Club and teachers at the Mount Sinai PTO Craft Fair. Mount Sinai, NY - November 26, 2013 - On Saturday, November 23rd, Legislator Sarah Anker joined the Mount Sinai Parent-Teacher Organization (PTO) at its annual Craft and Merchant Fair. The event was held at Mount Sinai Middle School and featured a bake sale, raffles, and a visit from Santa. 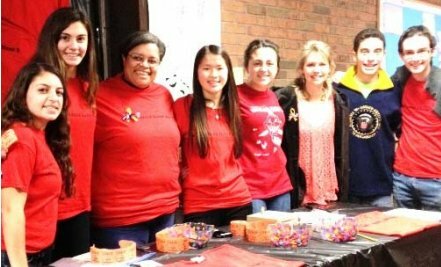 The Mount Sinai PTO assists in many programs to benefit the Mount Sinai School District, including Box Tops for Education, blood drives, Homecoming events, and holiday bake sales. For more information visit www.mtsinaipto.com. Subject: LongIsland.com - Your Name sent you Article details of "Legislator Anker: Supporting Our Local Parent-Teacher Organizations"